Cuts components like bolts, nails. Rivets. Etc. up to 1/8" dia. This PVC makes clean, burr-free cuts in PVC and flexible pipe. The steel construction provide great strength while the reversible blade doubles life. Built-in guide helps cut pipe squarely. The high-leverage design of these Diagonal-Cutters provide 36% more cutting and gripping power. 2000 Series knives cut ACSR, screws, nails and most hardened wire. The angled head makes it easier to work in confined spaces. Exclusive handle tempering absorbs the "snap" when cutting wire. Klein Tools specializes in making some of the world's finest pliers. The high-leverage design of these 8'' (203 mm) Diagonal-Cutting pliers provide 36% greater cutting power than other pliers. The hot-riveted joint ensures smooth action with no handle wobble. Klein Tools' top-of-the-line hole making products provide accuracy, consistency, strength and long-lasting performance to meet the needs of professionals. 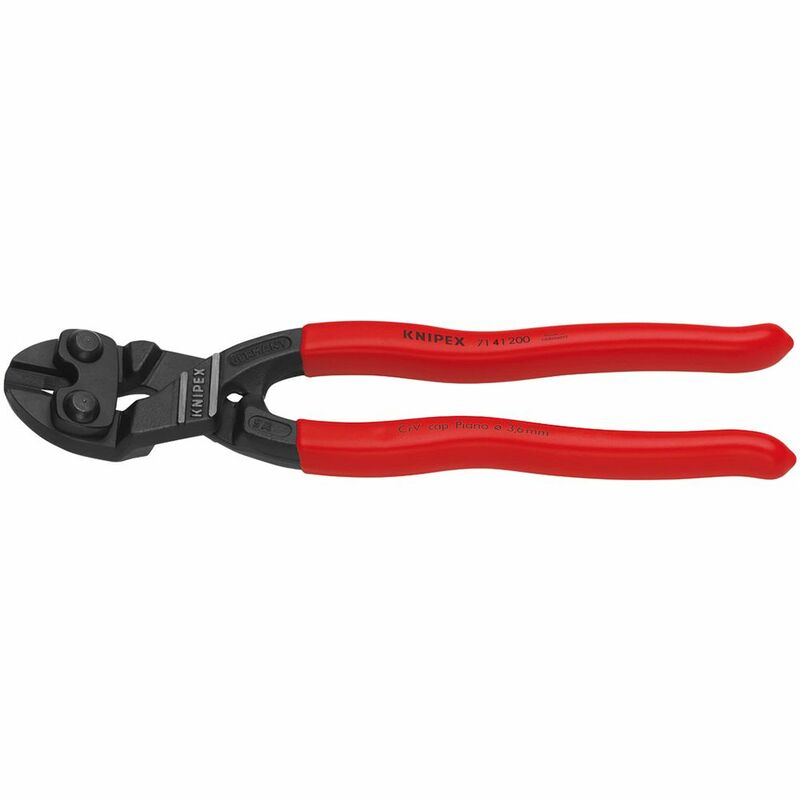 Klein's Electricians Tubing Cutter cleanly cuts and snaps conduit to save time and effort on the jobsite. Klein now offers even more hole making solutions to help get the job done right. 8 Inch Angled Hih Leverage Cobolt Cutters W/Notch Knipex Tools is the worlds largest manufacturer of professional pliers since 1882. Knipex Pliers, Cutters, Insulated Tools and other products have been the tools of choice for Professional Tradesmen and end users who are serious about their hand tools and demand industrial quality. Knipex Tools are made from start to finish utilizing the highest quality materials. Based in Germany, KNIPEX Tools are German engineered to produce a tool unmatched in the industry in terms of features, comfort, design and performance. 8 Inch Angled Hih Leverage Cobolt Cutters W/Notch is rated 5.0 out of 5 by 1.